The company's strategy to "cut out the noise" of healthcare data involves aggregation, interpretation, application, and iteration. Chronic disease management startup Livongo announced a handful of new offerings and partnerships this week, all organized around the theme of “Applied Health Signals,” a framework for thinking about the technologies and capabilities Livongo offers. The new offerings include voice-enabled blood pressure monitoring, a new program that allows Livongo members to get medications for free via co-pay waivers and a new data partnership with medication adherence tech company Medisafe. The voice offering allows the user to interact with Livongo’s recently announced cellular-enabled blood pressure monitoring system via voice. Livongo’s platform will be able to deliver it’s health nudges — small, actionable units of health advice — via voice. The co-pay waivers for medications are being delivered as an incentive to help persuade patients to check their blood pressure or blood sugar regularly. Livongo connects with all the various stakeholders to make that work. Both the medication incentive program and the voice interface will launch in 2019. 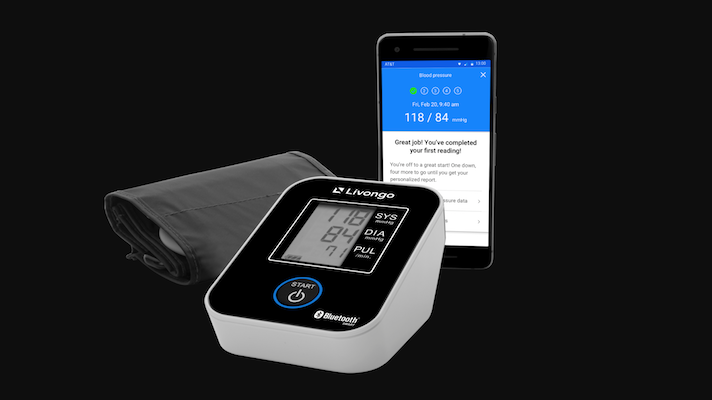 While skeptics have painted Applied Health Signals as little more than a marketing ploy, Kendale said Livongo is all in on the strategy, which it sees as a remedy for a cluttered digital health ecosystem. “Health signals” refers to all the various kinds of health data that can be gathered from consumers. Livongo’s framework is built around doing four things with that data. Abbreviated as AI+AI, they are: aggregating the data (or collecting it in the first place), interpreting it, applying it (that is, using the data to make changes), and iterating — continuing to improve the processes through which this is accomplished. Founded in 2014 by former Allscripts CEO Glen Tullman, Livongo has grown from a diabetes management startup to a company focused more broadly on chronic condition management, and it continues to expand to new areas. Livongo has been busy this year, starting with $105 million funding deal and the acquisition shortly thereafter of weight loss company Retrofit, both in April. In September, the company announced a deal with Abbott to offer the Freestyle Libre Pro to some customers and, at Health 2.0, announced cellular-enabled blood pressure monitoring to serve older populations that might not be equipped with smartphones. Along with that announcement came a redesign of the company’s patient app as well.